Discard pile hate is increasingly useful, as many factions have options to get cards "back from the grave" (characters, spells, tactics, tomes, artifacts and now madnesses...). 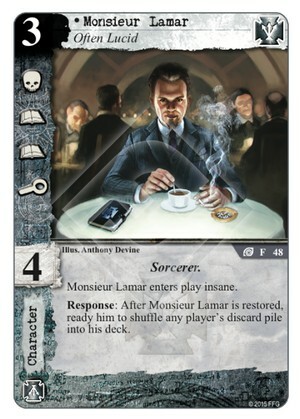 And if your opponent is not digging in the past... then Lamar can always recycle your own discard to give you a chance to draw lost marvels again. Icons and skill are fine. 3/5.